General Motors plans to equip 1.7 million of its 2009 models with a system that allows OnStar operators to cut engine power in the car if the police request it. The system was demonstrated in Washington, D.C. today. GM's OnStar system already contains built-in GPS tracking that would allow police to find any OnStar-equipped vehicle. With the new technology, if the police request it, an OnStar operator will inform the occupants of the vehicle and then cut power. The engine will be slowed to idle speed, to allow the driver to move to the side of the road. Brakes and other electrical functions of the vehicle will still work. The intent of the system is to cut down on the number of police chases, which can be dangerous for both bystanders and police. A recent study showed that from 1994 through 2002, there were 2,654 crashes involving 3,965 vehicles and 3,146 fatalities during police pursuits. The idea for this capability was showcased recently in science fiction author Greg Bear's book Quantico. In the novel, a near-future story about biotech and the war on terror, police could use Cop Block to stop a car or truck in its tracks. "...When the truck's driver ignored his lights and siren and the trucks failed to respond to Cop Block, the patrolman became aware he might have a situation..."
All cars and trucks in the U.S. were now required to have Cop Block. A patrol car could radio a coded signal that slowed and then shut down the engine. GM also stated that the owner of the vehicle may opt out of the service upon request. 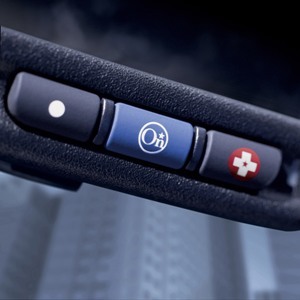 GM's research has indicated that 95% of current OnStar subscribers would like to participate. Update 20-Oct-2009: Keith Laumer used an earlier version of this idea in his 1965 novel A Plague of Demons; see the entry for police control-override. End update. Take a look at other initiatives to make the roads safer, like the prototype car seat and Nissan Pivo 2 concept car, which try to detect drivers sleeping behind the wheel. Read an interview with Greg Bear about Quantico. Story via ABC News.